In 1995, Company President and now chief renewable-energy-technologist Ben Jason began installing battery based solar PV (photovoltaic) electric systems – the only kind available then. Few at the time imagined solar electric systems connected to the grid. 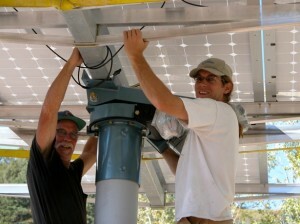 Through numerous courses at Solar Energy International and construction of various systems at his own, family members’, and acquaintances’ homes, Ben learned how to design, install, and troubleshoot solar electric (both battery based and grid-tied), solar thermal, hybrid solar-generator, wind, and micro-hydro renewable energy systems. Not knowing which direction the renewable energy may eventually go, he became proficient in all these technologies, forming Sustainable Living Technology and making happen just about every type of small to mid-range renewable energy system commercially available. In 2007, recognizing Ben and his family run business as the Four Corners area’s best renewable energy technical resource, SunPower – well recognized as manufacturer of the world’s top-of-the-line solar panels – partnered with Ben, making Sustainable Living Technology the only authorized dealer of residential solar electric systems in the Four Corners. (No, solar panels are not all the same, even those with the same kilo-watt rating! 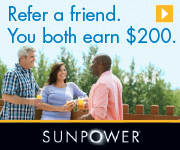 Learn more from SunPower.) Today, Ben and his team is recognized as an authority on renewable energy technologies suitable to the southwestern U.S., occasionally serving as a guest instructor at San Juan College’s renewable energy program. As the solar PV business grew through incentives, dropping solar system prices, fairer terms for and simplified grid-interconnectivity, and rising electric rates, Ben brought on additional installers, sales assistants, accountants and others to help with the workload. Even still, right up into 2011, SLT advertised mainly through just word-of-mouth, one satisfied client to the next. In 2010, Living Solar also became a SunPower authorized commercial system provider as well. With solar panels prices dropping, more and more folks kept looking to Ben to design and install a solar PV system for them too. With the increasing focus on solar electric systems given their cost-effective returns, SLT thus became Living Solar – using our expertise to not only design and install on and off-grid solar electric systems, but more fundamentally help advise our clients as to the most workable, efficient, and cost-effective energy efficiency and renewable options available for their specific situation. Today, Living Solar has designed and installed over 400 solar PV systems from just a few kW all the way up to a several hundred kW commercial systems in both single and three phase, bringing online almost half of the solar electric systems in La Plata Electric Association’s service territory, and many more outside of it.